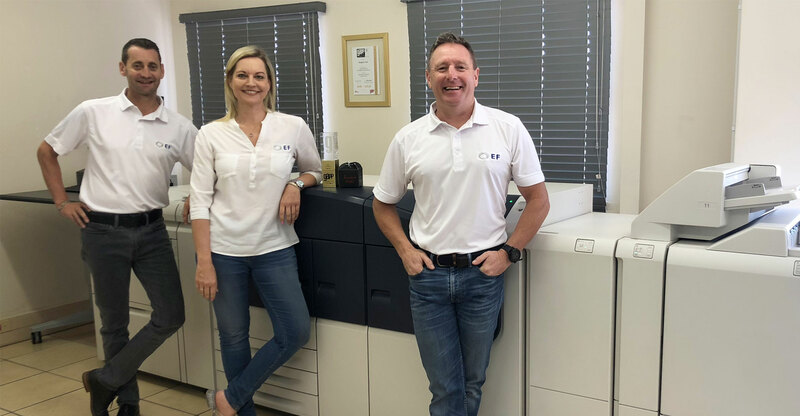 ElegantFoil has bought the groundbreaking Xerox Versant 3100 colour digital press from Xerox Business Partner, DigiPress and Altron Bytes Document Solutions (BDS). BDS is the largest Xerox distributor in the world, offering the complete range of document equipment, software solutions and services to 26 sub-Saharan Africa countries. ElegantFoil has long been a Xerox customer. This commercial finishing company was founded by George Carnell in 1986 as a foiling business, producing business cards, invitations and letterheads. As the business grew, its range of services expanded to include die-cutting, creasing, embossing and digital printing on a much larger scale. The business diversified into a complete trade finishing operation in 2016 and moved to new premises in Gosforth Park, Germiston. Following George’s retirement in that same year, the company is now under the leadership of his son Craig Carnell, Lana Chester & Brad Frew. The company’s first Xerox investment was in two Xerox 252s. These were replaced six years later with the Xerox J75 — the first to be sold in South Africa, and now the Versant 3100. Featuring advanced levels of automation and productivity, the Versant 3100 is an easy- to-use, fast, heavy-duty printer. A production workhorse, it prints at speeds up to 100 pages per minute, and handles average volumes of 250 000/month. It’s an ideal choice for busy niche print shops like ElegantFoil, that need to turn jobs faster, boost productivity and improve margins through automation. “It also comes with an inline spectrophotometer for increased colour automation, and it captures corporate colours with amazing accuracy, enabling the company to achieve what its competitors cannot. It’s also able to print on a wide range of media types, including coated and uncoated papers, bright papers, labels, business cards, glossy brochures and window decals, Jason Patch concludes. ElegantFoil offers state-of-the-art technology, combined with a level of service, dedication and commitment that sets it apart in the industry. Situated in Gosforth Park, Germiston, their aim is not to be the biggest but the best!